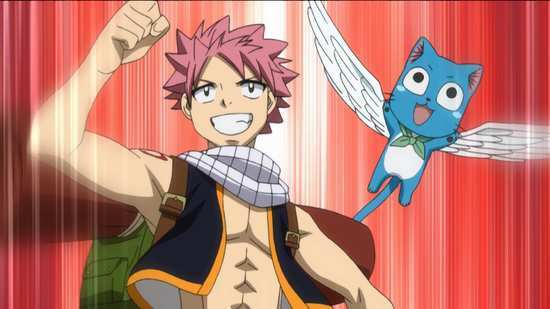 I’ve reviewed a lot of Fairy Tail, pretty much everything up until Fairy Tail Zero, and more of it from Funimation via Anime Limited than Manga Entertainment ever released. At the end there, Fairy Tail was getting pretty mundane, not helped by some of the worst anime filler episodes ever devised. 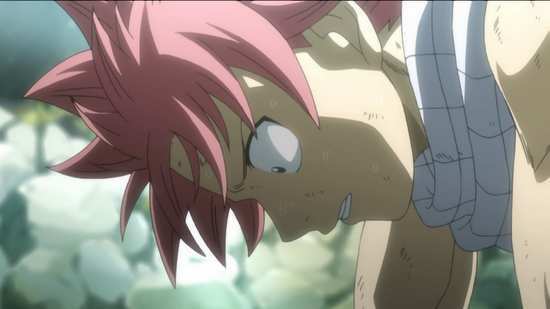 But there was a time when Fairy Tail was the best thing since proverbial sliced bread, certainly the best long shonen anime out there, and most of that good stuff was released by Manga Entertainment and on Blu-ray as well. So when things went south in their relationship with Funimation, and they went and released Part 9, their final Fairy Tail outing on DVD, and a hideously authored DVD at that, I was incensed, and driven to import Part 9 over again so I could have it in watchable form. This Funimation release of Fairy Tail, Collection 5 actually collects Parts 9 and 10 together (10 was released here on DVD only by Funimation), as a BD/DVD combo, and this was the last collection of Fairy Tail from Funimation that was Region B compatible. If you want more, you’ll have to import the Australian releases from volume 11 onwards. The Kingdom of Fiore is a rather special place, a nation of some 17 million where magic exists, is commonplace, and is a commodity to be bought and sold. Those who become proficient in magic are the wizards, and together they form guilds to serve the community, or serve themselves. The most famous, and indeed the most infamous guild of them all is Fairy Tail. 17-year-old Lucy Heartfilia is a wizard, or rather she wants to be a wizard. She’s already skilled in a Celestial magic, able to summon spirits to do her bidding using Gatekeys. 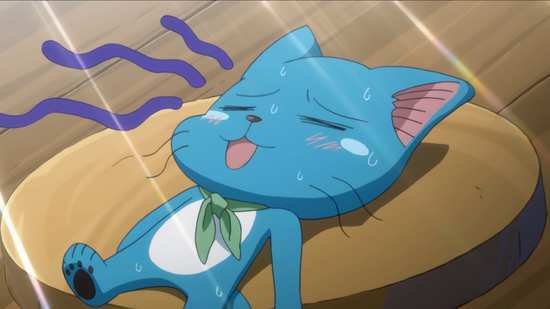 Her dream is to be in Fairy Tail, and when she meets a travelsick young wizard named Natsu, and his talking cat companion Happy, it seems like destiny has brought them together. 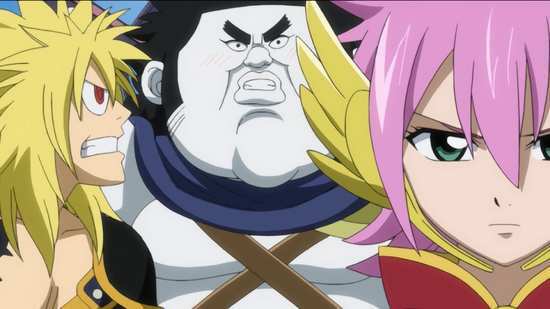 Now Lucy has joined the Fairy Tail Guild, and with its unique roster of wizards, including Natsu, the ice wizard Gray Fullbuster, and the armour wizard Erza Scarlet, and the flying cat Happy, they undertake the toughest, the most challenging, and the weirdest of missions. 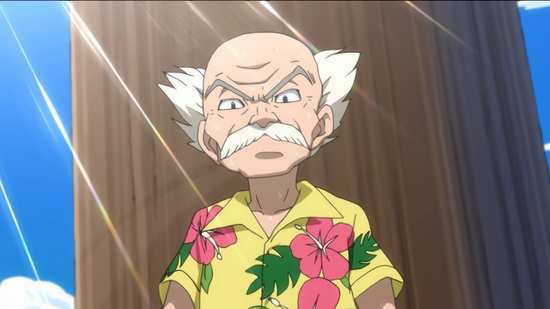 Funimation released these twenty-four episodes of Fairy Tail across four Blu-rays, and repeated again across four DVDs, and as this collection begins, the Edolas arc has just concluded, and we are about to commence upon the Tenrou Island arc. It’s that time of year again for the Fairy Tail Guild members. 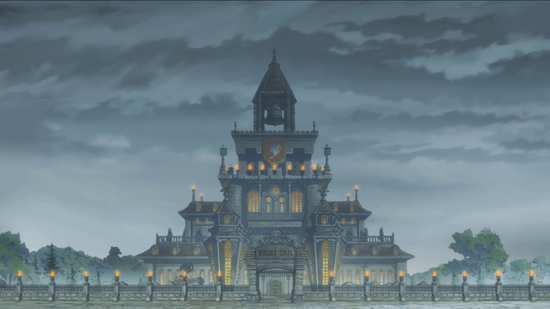 The Chunin exams are upon them, I mean the S-Class Wizard test, which sees eight candidates selected from the best performing wizards that year to compete for the one S-Class Wizard place on Tenrou Island, a magical place sacred to the Fairy Tail Guild. 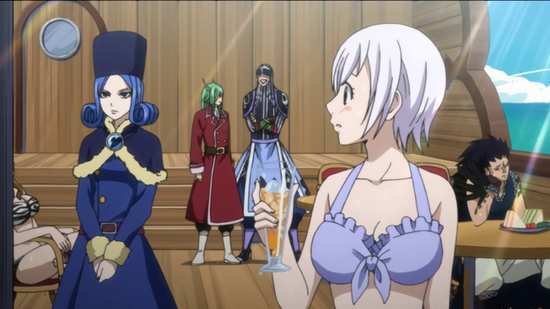 For Cana Alberona, it’s her fifth and final chance to become an S-Class wizard like Erza, Mirajane and Gildarts, but this year she’s up against the likes of Natsu, Gray, Elfman, and Juvia. Fortunately, they don’t have to face the challenge alone, and can choose one lesser wizard to be their partner. 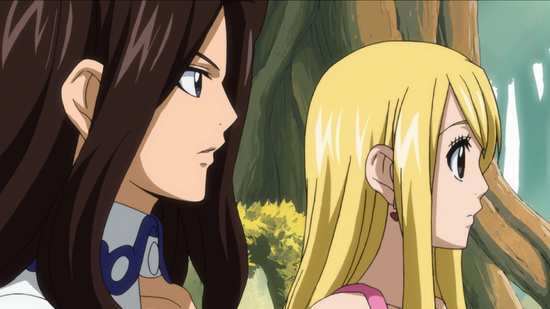 When Lucy hears Cana’s story, she volunteers to help her, but there’s a dark outside force with ominous plans in store for this year’s S-Class test. 98. Who’s the Lucky One? Blu-ray should mean sharp, crystal clear, high definition animation. Not so much with Fairy Tail though, as while the show does get a 1080p widescreen presentation at the 1.78:1 aspect ratio, it’s clear that the show was animated at a lower resolution and scaled up. It looks little different from the DVD presentation, soft and with somewhat muted colours. I also get the feeling, given the odd bit of judder in pans and scrolls, particularly during the credit sequences, that it’s been converted to a progressive format from an interlaced source. However this was less evident in this collection than it has been in previous releases. What the HD presentation does offer is clarity and smoothness of character artwork, with no aliasing to speak of, and compression artefacts completely absent. And you do get a 24 fps progressive presentation, without any of the PAL speed-up or pitch correction that you would get with a PAL DVD. That alone is reason enough to opt for the Blu-ray. The image is clear and generally very pleasant too watch. It’s a bright, lively anime, and given that it’s a long running series, the character designs are understandably simplistic, the world design not overly complex. It’s full of primary colours, and the animation itself is energetic, especially through the various spell sequences. I did have an issue with the first disc, freezing and breaking up about four minutes into the second episode, but that only occurred on my Panasonic Home Cinema; on a newer, standalone Panasonic player, the episode played through without issue, so it’s either a compatibility issue or a dodgy disc. Fortunately, the episode is also presented on the DVD in this collection. You have the choice between Dolby TrueHD 5.1 Surround English, and Dolby TrueHD 2.0 Stereo Japanese, with optional translated subtitles and a signs only track. You do get the added clarity and range of a lossless presentation, but it’s still pretty similar to the DVD, although I must once again reiterate that it’s at the native frame rate and without any speed-up or pitch correction. I sampled the English dub, and found it to be a typical anime comedy dub, high pitched female voices, and loudness and manic intensity substituting for humour. My preference as always was for the Japanese audio track with the subtitles. It too is adequate, although one slight point of annoyance for some may be the lead character of Lucy played by Aya Hirano, who simply supplies another variation of her stock Haruhi Suzumiya tsundere voice. Otherwise it’s a fairly run of the mill audio track, playing the show for laughs, with little yet to stretch the characters. More impressive is the show’s music, which with a pop Celtic theme supplements the show’s magical themes very well, although it is boosted by a wholesale plundering of the classical music archives. The subtitles are clear, well timed, and free of error throughout and with a nice smooth HD font. The discs get animated menus. Disc 1 autoplays a trailer for Robotics;Notes Part 2. The sole extra is the audio commentary on episode 97, with ADR Director Tyler Walker, Tia Ballard (Happy), and Todd Haberkorn (Natsu). Disc 2 has two commentaries, a video commentary on episode 99 with Tyler Walker, Todd Haberkorn, and Tia Ballard joined by script adaptor and voice of Mirajane, Monica Rial and the audio commentary for episode 107 with ADR Director Tyler Walker, Michael Johnson (Caprico/Capricorn), and Justin Locklear (Rusty Rose). You also get two sets of textless credits, the US Trailer, and Funimation trailers for Wolf Children, Shakugan no Shana, One Piece, Spice & Wolf, Eureka Seven, Kamisama Kiss, and the Anime Classics label. Disc 3 autoplays with a trailer for Karneval, and it has an audio commentary on episode 109, featuring ADR Director Tyler Walker, Cherami Leigh (Lucy), and Bryan Massey (Kain Hikaru). On disc 4 (which autoplays with a trailer for Dragon Ball Z), there is a commentary for episode 119, featuring Tyler Walker, Tia Ballard (Happy), Jad Saxton (Charle), and Rick Keeling (Pantherlily). 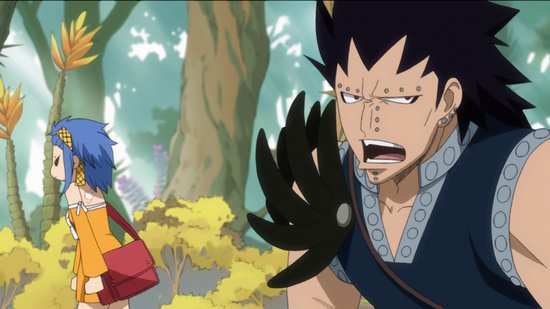 We also get the Marketing a Fairy Tail featurette which lasts 19:13, and looks at the Funimation Graphic Designer, Brand Manager, and Trailer Editor, and how their roles apply to Fairy Tail in particular. You get the US trailer for this volume, and further trailers for Attack on Titan, Date A Live, Red Data Girl, Serial Experiments Lain, Spice and Wolf, Eureka Seven, and the Anime Classics label. Finally there are the textless credits, two openings, and two closings, and remember to turn the subtitles off to render them truly textless. 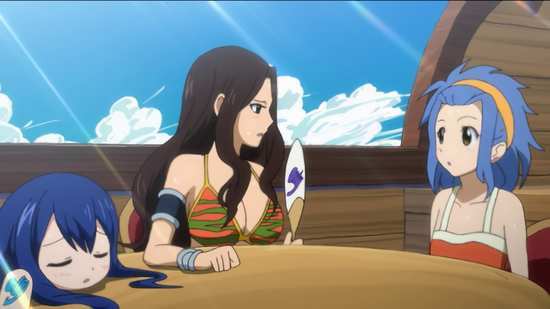 It’s twenty-twenty hindsight at this point, but the Tenrou Island arc is as good as Fairy Tail got in anime form, at least until the end of these two series with Part 22. That’s more than half of Fairy Tail that failed to live up to this set of episodes. Certainly some of the filler arcs let the side down, but even the canon storyline tended to get bogged down in convolution and tortuous narrative once we got past the time-skip. Here, the balance is spot on. The characters that were introduced to this point have been developed in interesting ways, but not yet weighed down by back-story. The narrative is straightforward, and the balance between story, action, comedy and heart is still enacted with micrometered precision. I’ve written about this twice before, although not too complementary when it came to the Part 9 review (that was Manga’s two-disc disaster). My review for Part 10 accurately sums up what I feel about this arc and the show as a whole to this point. You have 24 unmissable episodes here, great characters and an engaging story. It’s fun, uplifting, and thrilling in all the right ways. I have to be honest; the early Fairy Tail Blu-rays aren’t up to much, although that’s down to the source material. What you do get is relatively uncompressed SD visuals, scaled up to 1080p, looking as good as the best DVDs can, but you do get lossless audio and that silky smooth scratchproof coating on the discs. The real benefit here in this combo collection is that both the DVDs and Blu-rays fix all that was wrong with the Manga release of Part 9, and there was a lot wrong with that release. Also, as Manga have released Parts 1-8 on Blu-ray, and this US release is the last of the Funimation Fairy Tail Blu-rays that play on Region B, you can effectively have the best of Fairy Tail in high definition in this country.